From left to right: Salamander Hospitality Vice President Chuck Pomerantz, Pat Bradley, Renee Powell, Innisbrook Owner Sheila C. Johnson, Legends Tour CEO Jane Blalock, Carol Corcoran, Colleen Walker, Dale Eggeling. 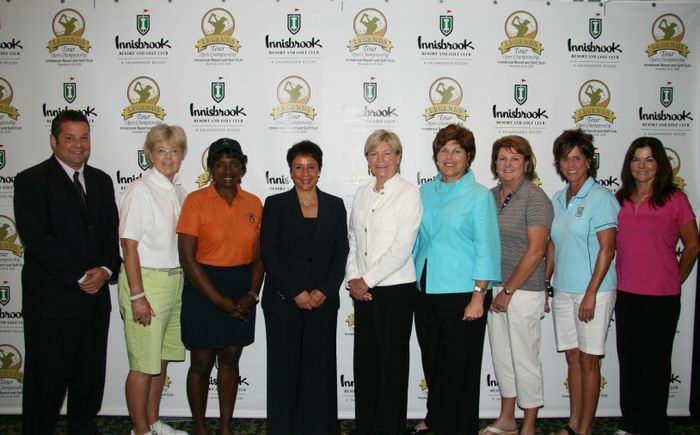 INNISBROOK, FL, July 16, 2009 – The Legends Tour, the official senior tour of the LPGA and comprised of the greatest female golfers of all time, will play its first major championship at Innisbrook Resort and Golf Club in November. The Legends Tour Open Championship will be contested on Innisbrook’s Island Course from November 20-22, 2009, and feature a $300,000 purse. The announcement came at a press conference at Innisbrook that featured Legends Tour CEO Jane Blalock, LPGA Acting Commissioner Marty Evans, Innisbrook Owner Sheila C. Johnson and several of the Legends Tour players, including past champion Rosie Jones, Dale Eggeling, Colleen Walker, Rene Powell and Pat Bradley. 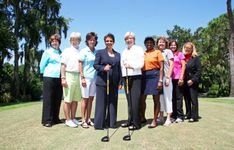 The Tour has over 100 members, including nine LPGA and World Golf Hall of Fame members, and its players have over 600 LPGA Tour victories and 55 major championships. The 36-hole stroke play tournament, which is sanctioned by The Legends Tour, will feature two days of competition, a pro-am, and community outreach programs like children’s and women’s golf clinics. Tickets will be available via local charities as well as online and at the gate. More detailed ticket information will be released on August 15. Sponsorship opportunities are available at every level. For information, including pro-am spots, contact Megan Gardner at 617-997-6194 or via e-mail at mgardner@jbcgolf.com. Additional tournament information can be found at www.legendstouropen.com or www.thelegendstour.com. Previously played in <?xml:namespace prefix = st1 ns = "urn:schemas-microsoft-com:office:smarttags" />Japan and Australia, the Legends Tour Open Championship has been elevated to major status by Tour officials for 2009. The event is sponsored by the International Sports Promotion Society (“ISPS”), an organization created by Dr. Handa, a Japanese businessman and philanthropist. It is a part of The Legends Tour’s Handa Series, which features other international events sponsored by Dr. Handa. Innisbrook, which has recently completed an extensive renovation under the guidance of its management company Salamander Hospitality, currently hosts the PGA TOUR’s Transitions Championship event every March at its Copperhead Course. In a previous incarnation, that tournament featured mixed teams of male and female professionals, which proved popular with spectators. Like Innisbrook’s three other championship golf courses, the Island Course was designed by Larry Packard. With tight fairways, 70 feet of elevation changes, intimidating water hazards and abundant bunkers, it is considered by many to be as demanding as the Copperhead Course. The Island Course has played host to numerous U.S. Open qualifiers, NCAA Championships and has been ranked among the country's top 50 resort courses by Golf Digest. For more information about the Legends Tour Open Championship, visit www.legendstouropen.com. For more information about Innisbrook Resort and Golf Club, visit www.innisbrookgolfresort.com or call (727) 942-2000. The Legends Tour is the Official Legends Tour of the LPGA. The tour began in 2000 by LPGA professionals to showcase the talents of some of the greatest women’s golfers of all time. The Legends Tour has over 100 members, including nine LPGA and World Golf Hall of Fame members. Legends Tour players have over 600 combined LPGA Tour victories, including 55 major championships. In its seven seasons, The Legends Tour has awarded more than $6 million in prize money and donated more than $7.25 million to charity. The Legends Tour has hosted events in Connecticut, Florida, Indiana, Iowa, Massachusetts, Michigan, New Jersey, Wisconsin, Japan and Australia. For additional information on The Legends Tour, log on to www.thelegendstour.com.